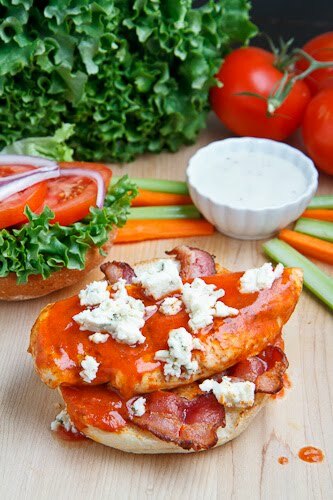 Grilled chicken breast covered is buffalo hot sauce in a club sandwich with tangy blue cheese. As many long time readers are aware, I am a big fan of buffalo chicken wings and I have been having fun experimenting with spinning the flavours of the buffalo chicken wings in different dishes. After having one too many boring chicken club sandwiches at a restaurant I have also been on a kind of mini quest to come up with tasty new chicken club sandwich recipes. The idea to combine the two dishes seemed not only natural but really tasty and thus the buffalo chicken club sandwich was born! The basic chicken club sandwich normally consists of the chicken, bacon, lettuce, tomato and mayonnaise and I was thinking that coating the grilled chicken breast in buffalo hot sauce could only make things better. In addition to the buffalo hot sauce, I included some crumbled tangy blue cheese to finished the sandwich off and I served it with a side of carrot and celery sticks along with a blue cheese sauce for dipping. Heat the grill over medium heat and brush it down with oil. Grill the chicken until cooked and slightly charred, about 3-5 minutes per side. Mix the hot sauce and butter and coat the chicken in the mixture. Oh, YUM. My mouth is literally watering right now Kevin! I will be trying this soon! This looks great! Why didn't I think of it? Thank you for the inspiration. I love the crumbled blue cheese! This looks so good! I can see it being one of my husband's favorites… yum! This is insane, I'm craving your creation Kevin. That sandwich looks terrific and incredibly scrumptious! you really just can't go wrong with buffalo sauce! This sounds like an awesome sandwich! Yummm…. I make my family buffalo chicken omlettes some mornings. I too add Paprika to the chicken, and I add in 2 Tablespoons of Cream Cheese with Cheddar. Not fans of Blue Cheese. Love your blog Kevin! Thanks for sharing your new creations! Wow all your recipes are amazing. This looks delicious I want it NOW! Oh dear, the calories. Oh well, it'll be worth it! HOW nice does this sandwich look. Seriously. Hi Kevin, Just wanted to tell you I made your quiche with Guinness braised onions the other day and it turned out amazing! I followed the recipe exact but was out of Worcestershire sauce so I subbed soy sauce. I also added some mushrooms in the onion braise.It was one of the best quiche I've ever made. Thank you! 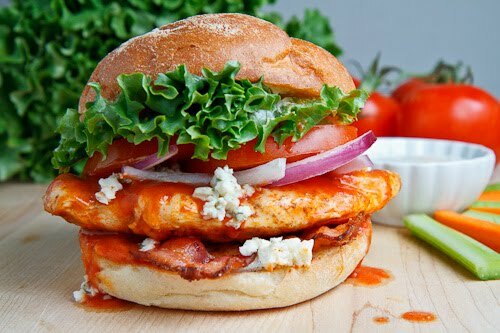 this sandwich looks stellar.. i love anything with buffalo hot sauce… ANYTHING! What a yummy sandwich! I love buffalo chicken and crumbled bleu cheeseeee – the perfect combination! Extremely great post, Kevin. I could stuff that thing in my mouth in 2 seconds flat. My boyfriend and I absolutely LOVE all of your buffalo chicken recipes. I've gone through a few… the dip is a favorite. This will be the next to try. Thank you!